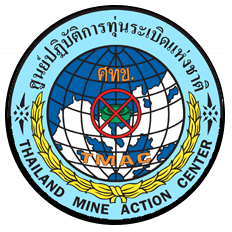 Until late 2014, APOPO assisted the Government of Thailand in accurately defining their mine threat. Through our survey efforts the Thailand authorities can now ensure that scarce and expensive mine clearance resources are directed towards the highest priority areas. This means that the land returned has the greatest positive impact for communities. APOPO and the Peace Road Organization (PRO), has been conducting Non-Technical Survey (NTS), technical survey, community liaison, mine/UXO risk education, polygon mapping, assistance to mine victims, capacity building of the national authority (TMAC) and minefield marking between 2011-2013. This joint project helped address the country’s landmine problem and assist Thailand to meet their obligations under the Anti- Personnel mine ban treaty. Thailand is one of the most popular tourism destinations in the world, yet few people are aware of the extensive landmine problem along the Cambodia, Lao, Malaysian, and Myanmar borders. Beside the direct implications for victims, the presence of mines prevents access to agriculture land, is a threat to food security and causes an increased pressure on the natural environment. A 2001 Landmine Impact Survey (LIS) identified 530 communities in 27 of Thailand’s 76 provinces and more than 500,000 people as mine/ERW-affected. The LIS estimated the total area of mine/ERW contamination at 2,557 km2. Thailand signed the Anti-Personnel Mine Ban Treaty on 3 December 1997 and ratified it on 27 November 1998, becoming a State Party on 1 May 1999. In 2009 Thailand´s request for an extension on its clearance deadline was extended to 1 November 2018. Thailand’s 700km-long border with Cambodia, used as a base by Cambodian non-state armed groups (NSAGs) in the 1980s and 1990s, is the worst affected, accounting for three-quarters of the estimated contamination and 51 of its 69 high-impacted communities. More than half of the mine incidents in Thailand have occurred on this border. 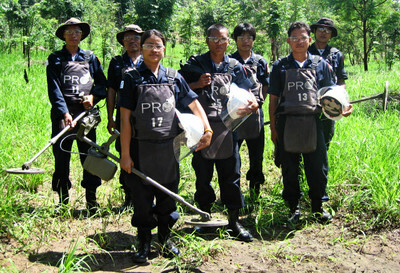 The APOPO-PRO teams conducted a systematic evidenced based survey to gather evidence of mines. As a result, previously considered mined areas with “no real evidence” of mines were cancelled and the Confirmed Hazardous Areas (CHA) were defined. The survey results were used to ensure that the scarce and expensive mine clearance work was focused only on those areas where there was a threat from mines. This removes the danger to civilians more quickly and as result save lives and enhances local economic development. APOPO suspended operations in Thailand at the end of 2013 pending decisions from donors not to continue support for Thailand. Only four military Mine Action units, one small national NGO and one international NGO continued conducting mine clearance activities within Thailand. This capacity is very small and needs significant expansion and enhancement to address the problem within an acceptable time frame.